We’ve all been to conferences before. Taken pages and pages of notes. Collected stacks of business cards and garbage bags full of free giveaways from vendors. Then we come home and what happens? After we’ve distributed the pens and pads to the kids – typically nothing happens. At least nothing until the day six months later when we run across that bag of junk from the conference and decide to throw it away. If you’re like most conference participants you’ll return to the office to face the urgency of all the business you ignored while at the conference takes over. Suddenly all those great ideas that you shared with people that you met become distant memories. 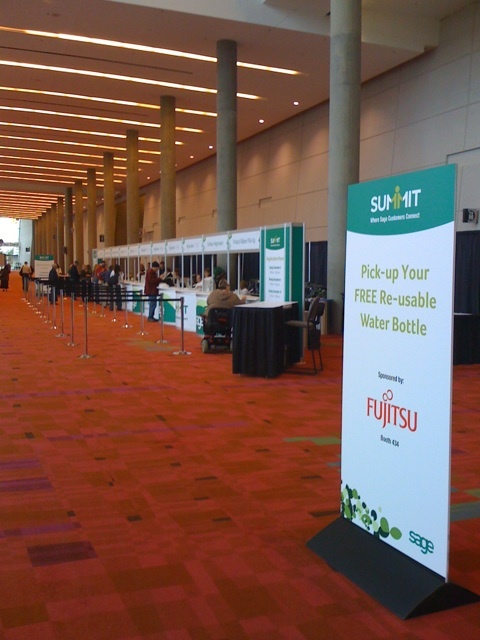 I’ve got five suggestions on how you can make the most of your Sage Summit Conference. I’ve implemented these after attending conferences in the past and the return on the time invested has been triple what it otherwise would have been. You’ve just obtained a few dozen business cards. Don’t let them go to waste. Instead setup a free Google Group where you can enter in everyone’s name and then invite them to participate with exchanging ideas all year round (not just during the conference). What do you talk about in a Google Group? The group that I am involved in (sageresellers) exchanges over 500 email messages monthly about technical topics that range from experiences with new MAS90 versions to experiences with add-on modules. We started the group by realizing that a dozen or so Sage consultants typically gathered each and every year at conferences to exchange war stories and technical tips. You can create the same type of group with other users of Sage Software who you’ve met at conferences. Use the power of group collaboration to bounce ideas off your peers or get second opinions about technology you’re considering. Best of all this advice is both trustworthy and free — because nobody in the group is trying to sell you anything. 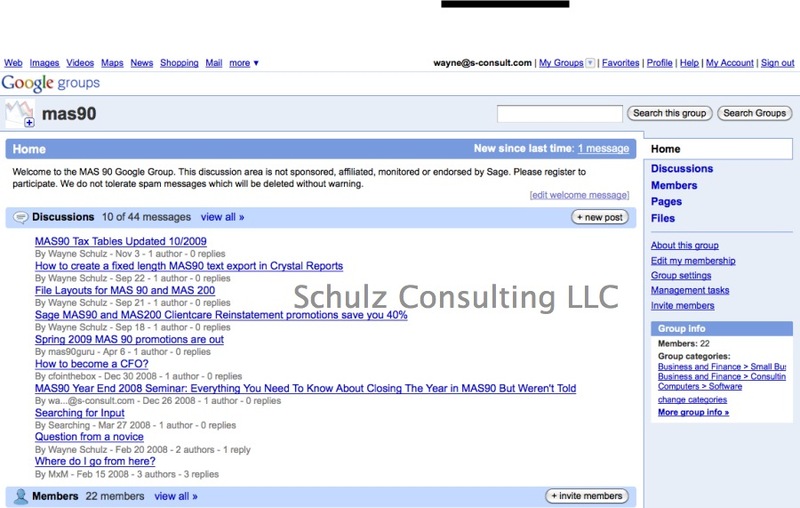 Google Groups are completely free and automate the task of sending out one email to a group of people. With Google Groups the people in the group don’t have to remember to “reply all” so that each person gets an individual email. 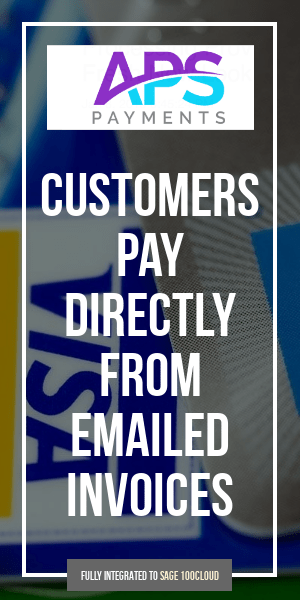 The group feature automatically delivers the emails and allows people to reply via email or they can log into the Google web site and read messages online. This is a great way to keep in touch and share technical tips with other users throughout the year. The next big thing is Twitter and Social Media (Facebook, LinkedIn) – at least according to the conference speakers. Yet you feel way behind because you’ve yet to start up a Twitter account – or know what to talk about if you had one. 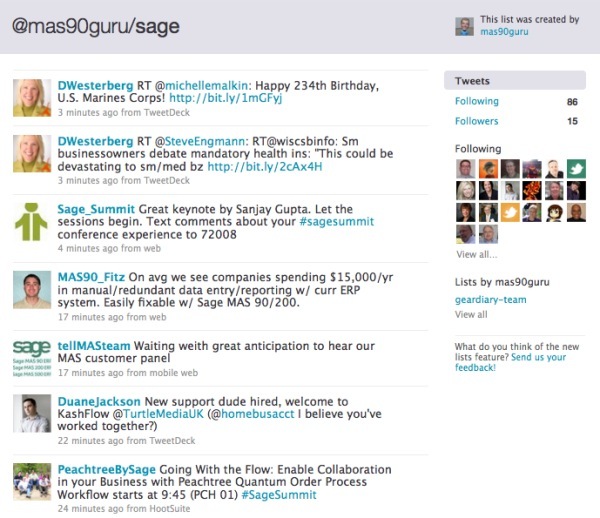 Use the power of Twitter Lists to view groups of people connected to Sage (consultants, end users, vendors) and observe what they’re chatting about. This isn’t an official Twitter stream and names are always being added each day. It’s a perfect way to start. Access our Twitter list of Sage related accounts (vendors, Sage employees, consultants) – here. It’s ok to lurk (read only) until you get the hang of this Twitter thing. Once you do become active you’ll see that Twitter is really not anything more than another way to stay in touch with friends and business acquaintances. What are you waiting for? Create your Twitter account here. Then add http://www.twitter.com/mas90guru and some of the folks in the Sage Twitter List. Most of the people you meet at the conference are probably active online with LinkedIN. Think of LinkedIN as Facebook for business. Here you establish online contacts and can participate in groups of people with similar interests. 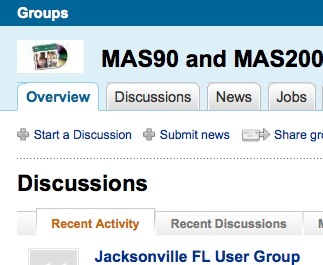 Two great groups are the Sage Partners, Employees and Alumni LinkedIN group and the MAS90 and MAS 200 Group. Although group discussions can vary in frequency and topic – the Sage groups tend to be very business focused and stay on the topic of Sage. Don’t let your experience with other LinkedIN groups that aren’t well managed deter you from joining a Sage group. The key to getting the most from your online groups is participation. Don’t be afraid to ask questions because chances are there will be half a dozen other people who wonder the same thing. When you can, step up and provide answers or assistance to other users. Share your candid experiences (both good and bad) with users who may be in the same industry or considering the same type of software setup. LinkedIN is a great structured site to make business contacts that can provide assistance to your company and to you personally. 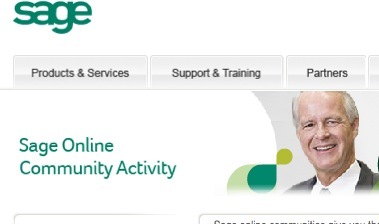 Did you know that Sage has various communities (discussion forums) where users meet to ask technical questions about products that they use? These communities are free and open to everyone. Once you’re a member you can ask questions and participate in discussions about the products that you use. One of my favorite uses of communities is to find unbiased references for software that I’m considering purchasing. The sales fliers always make software appear like it can do absolutely anything. The real story often is told when you find someone who has been using the software for a period of time and can give real world examples of both pros and cons of the program. Although many Sage staffers frequent the communities, you’ll find most of the support is member to member. One way to extend the benefits of communities is to keep in closer contact with the more active members – typically via email. 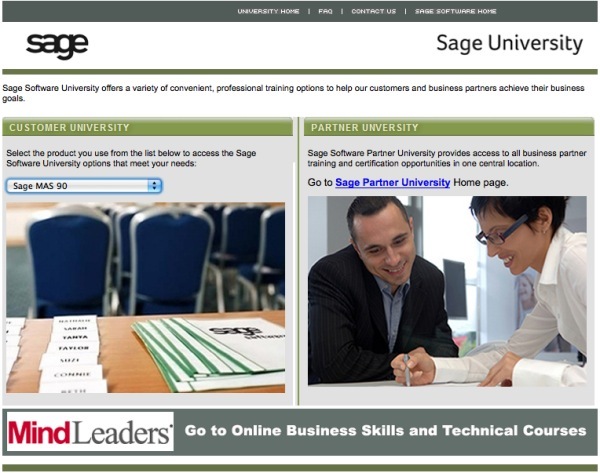 Did you know that Sage has regularly scheduled technical sessions. Some of these are free. And many have a nominal fee. You can look at the list here. There’s also self-study and other types of guides that you can purchase and use as your reference materials for the various Sage products that you use daily. These sessions are easily justified as I’ve found attending a seminar can save your company countless hours of consulting time both now and in the future. Don’t let the knowledge and friendships die down once you’ve left the shelter of the Sage Summit conference and returned home. All of the suggested activities above are available for free (or extremely low cost) and are great ways to keep the Sage Summit experience going after you’ve left the conference. Peer to peer networking is one of the best ways to learn and share important information from other users of the software just like you.